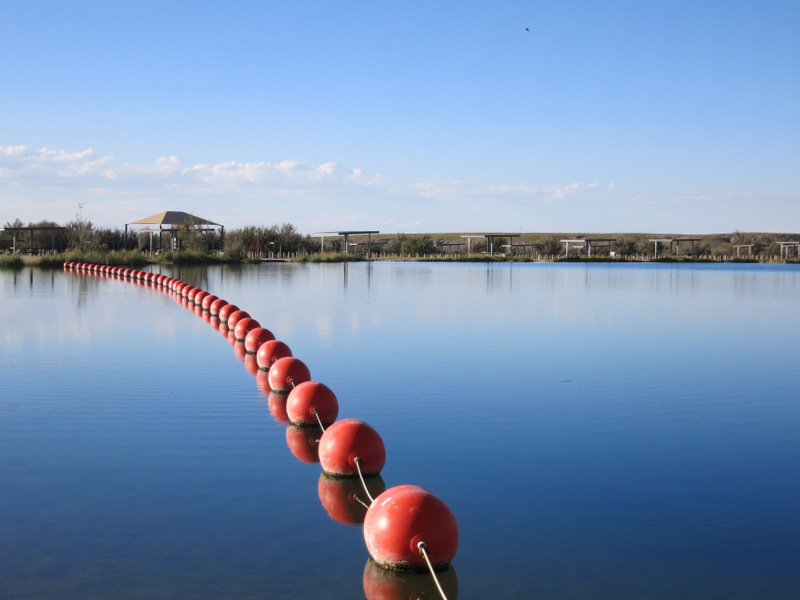 After fours days of balloons and socializing we exchanged the excitement of the Balloon Fiesta for the peace and quiet of Bottomless Lakes State Park. Last spring we spent a week at this small, well-kept campground on the edge of large sink hole called Lea Lake. It was hot during our stay in the spring, and we enjoyed cooling off in the refreshing lake several times. It was just as hot the second time around, and once again we went in for a dip. Strangely enough this is the only place where we swam all summer. I guess that’s what happens when you spend the majority of the swimming season high up in the mountains where the temperatures are cool and the water in the lakes and streams even cooler. With the exception of some morning and evening walks, we mostly stayed inside all week. The mosquitos were veracious to the point that standing or sitting outside for more than a few minutes meant you risked getting eaten alive. Much safer to just stay inside. Saturday morning we said our final good bye to New Mexico and headed east into Texas. 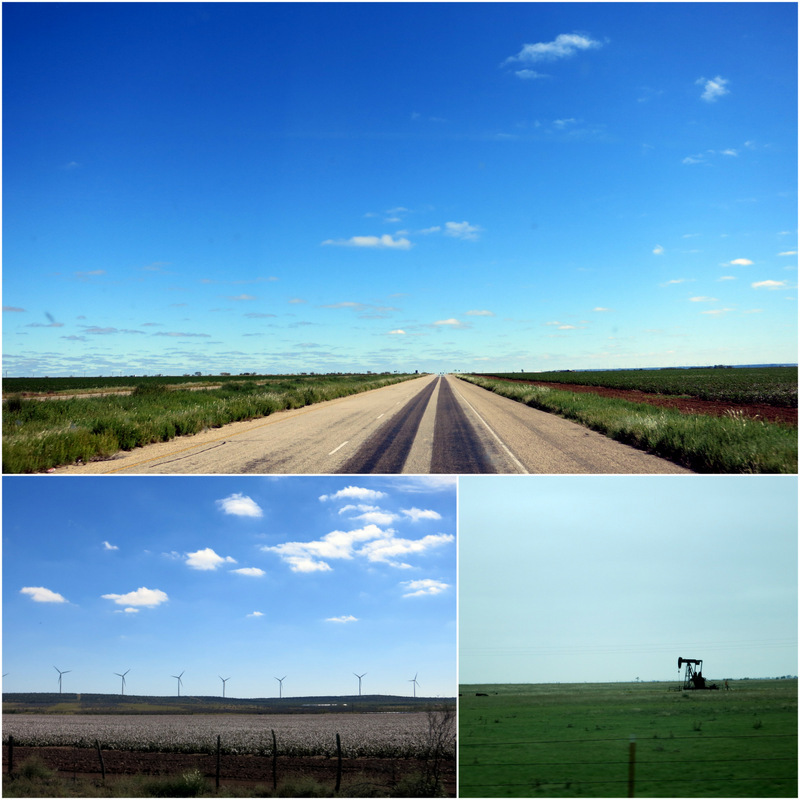 The drive across western Texas can be described with three words: oil, cotton & flat. We stopped the first night in San Angelo, TX after 5 hours of driving. We prefer to keep our drive time around 2-3 hours per trip, but were on a mission to get to Austin and were willing to put in a few extra hours to get there. After a night sleeping next to the big rigs in the Sam’s Club parking lot (we tried the very busy 24-hour Walmart next door before moving over to Sam’s Club where the manager gave us the okay to stay), we continued another 4 hours to Austin the next day. 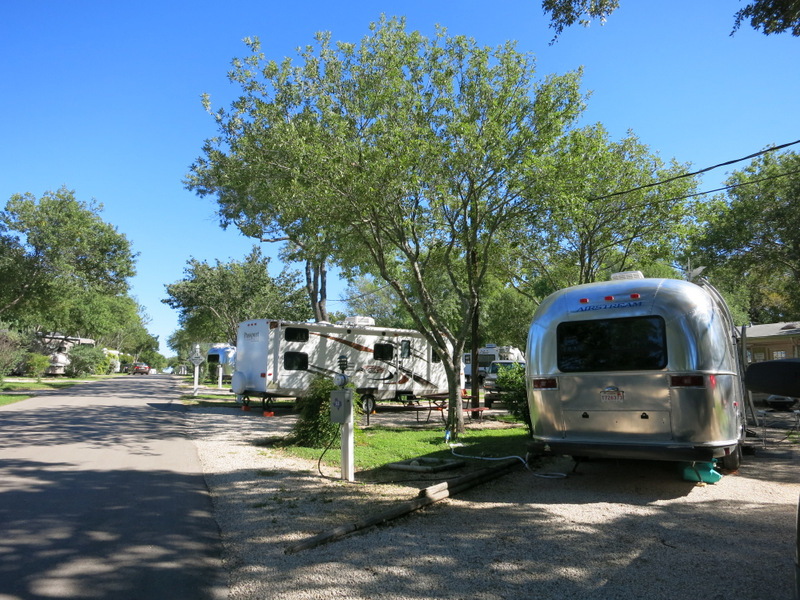 We’ll be here for two weeks, and since I couldn’t get us into our first choice of parks, McKinney Falls State Park, for the entire time, this week we’re staying at the Austin Lone Star RV Park. It’s an okay place, but I doubt we would stay here again. Here’s my take. Convenient location right next to I-35. 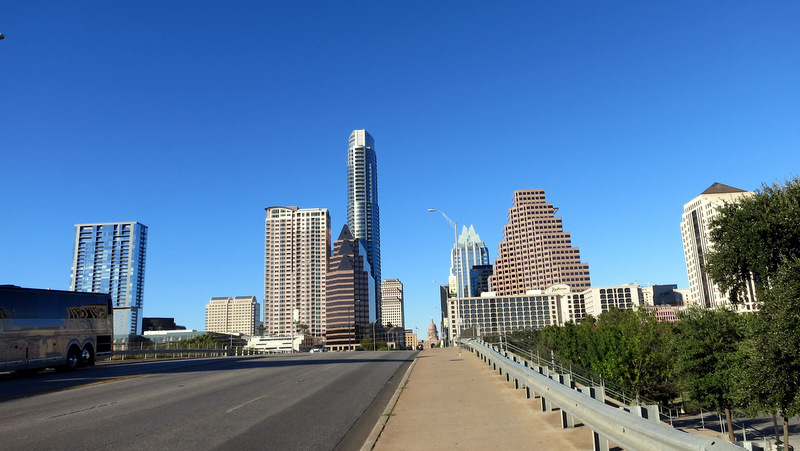 Depending on traffic is about a 15 minute drive to downtown Austin. Sooooo noisy. That same highway that makes this such a convenient place to stay, also makes it a very loud place to stay. We’re near the front of the park where the noise it the worst. Dated facilities. Old bathrooms with moldy shower curtains. 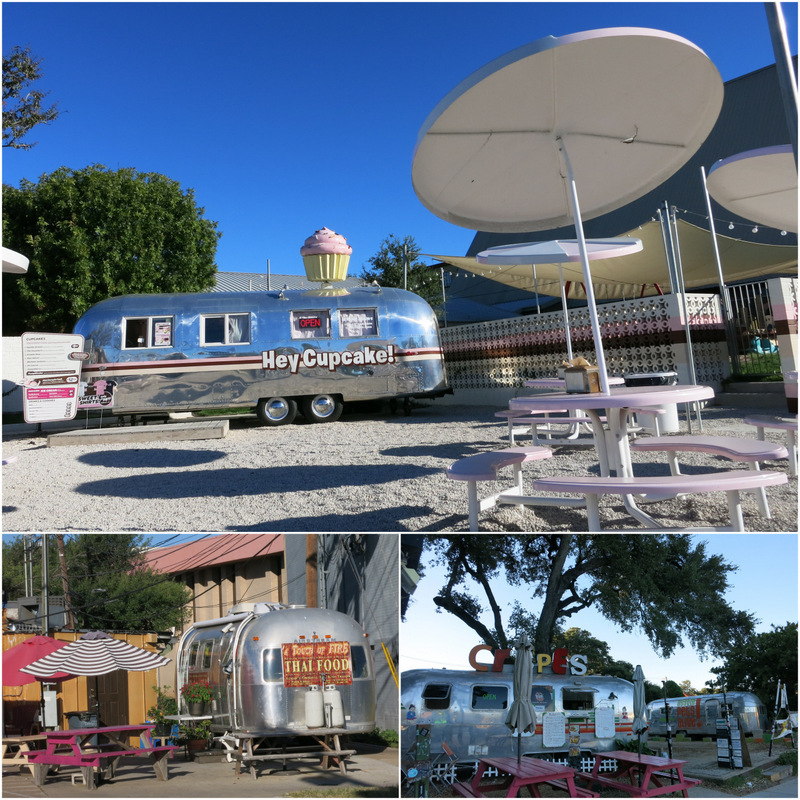 I was hoping to enjoy a long shower in bigger space than what we have in our Airstream. That is not what I got. Sticking with our own bathroom for the rest of the week. Overall it’s not a bad park, but it does reinforce why we always prefer public over private campgrounds. Looking forward to moving on Sunday. All complaints about noise and moldy shower curtains aside, we LOVE Austin. Part of me feels like it might be a bit premature to declare it true love already. I mean we’ve only known each other a few days, that’s moving a kind of quick isn’t it? The other part of me ignores this bit of practical wisdom…because it’s Austin, where BBQ reins supreme and there’s an Airstream food truck on every corner. What’s not love? Austin is a food lover’s paradise. Ninety percent of the advice we’ve been given on what do around here involves some sort of food. And if it doesn’t involve food it involves beer. So I guess over the next two weeks we’re going to be visiting breweries and eating food. Not too tough. We got the ball rolling right away with a brewery visit on the very first night we arrived. 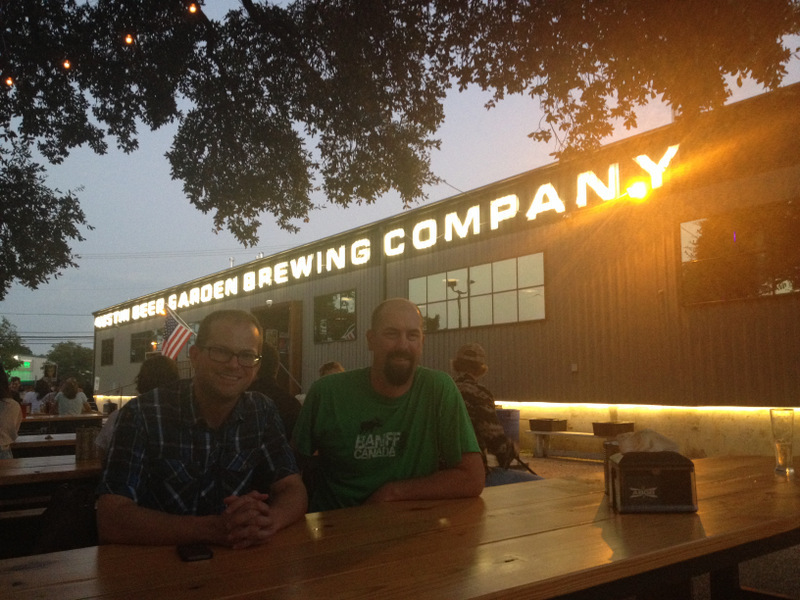 We met up with our RV friend Marshall at the Austin Beer Garden Brewery for some mediocre pizza slices, good beer, and even better company. We sat outside enjoying the warm, humid (gasp!) air and caught up on recent adventures for a few hours. Marshall has been in Austin for a while, and added even more recommendations to the ever growing list of food we must eat here. 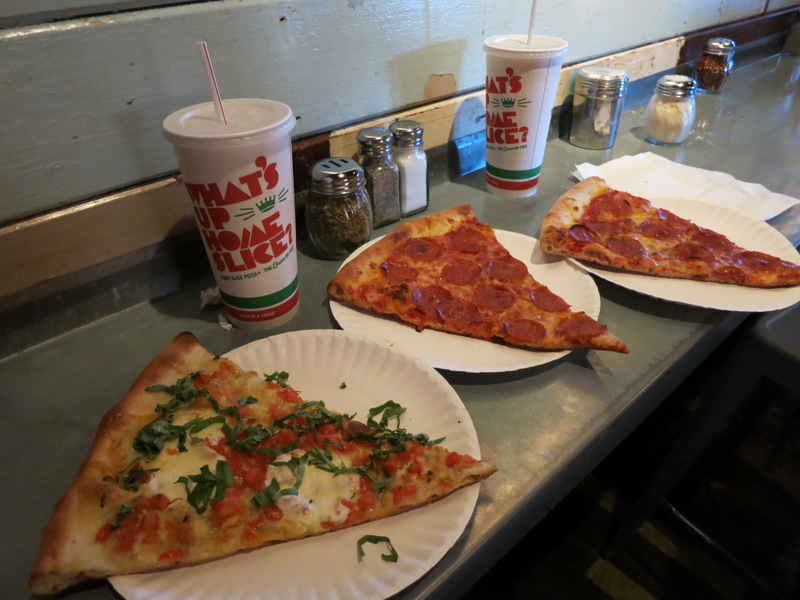 A few days later we found ourselves wandering around the trendy section of South Congress Street and decided to stop for a few slices at the highly regarded Home Slice Pizza. I had a margherita and Tim had two pepperonis. This was truly New York style pizza. A thin, chewy crust and just the right amount of sauce. My slice had lots of fresh basil and bits of tangy garlic. Delicious! Luckily there are a lot of opportunities to burn off all those extra calories we’re consuming, because we still need to hit up at least a few BBQ places, Torchy’s Tacos, the food truck scene, and another brewery or two. The goal is to balance every time we eat out with a healthy dose of exercise. So far so good. 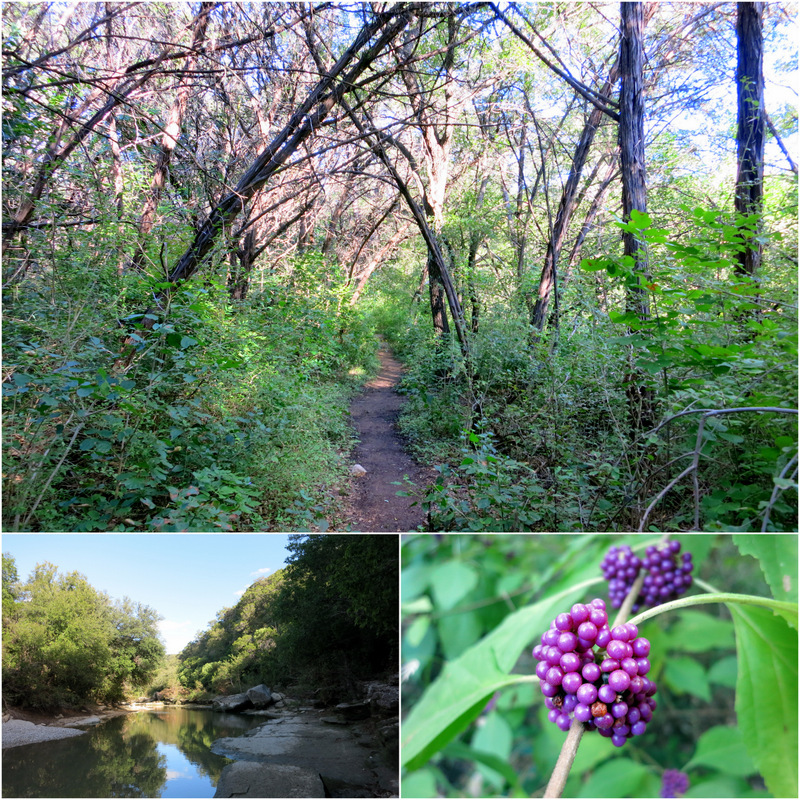 One day we went over to the Barton Springs Greenbelt and walked a few miles on the trails alongside a mostly dry stream bed. After reading a bunch of raving online reviews I expected a bit more in the way of natural beauty. I guess I need to remind myself that this is Texas not Colorado. Expectations need to be adjusted. I just told Hans we’ll be eating out a lot while in Austin! And looking forward to it too! Thanks for providing the combo of food spots and exercise spots! There’s no way around eating out around here! I’ll be posting about more exercise options (& of course more food) next week. I know you will get so many great recommendations, but please try not to miss the “East Side Kings” guys. (www.eskaustin.com) They have 3 or 4 different food trucks around (usually outside of bars,) and a permanent food location in the former “Hole in the Wall” bar along”The Drag,” i.e. Guadalupe. Their food is so fresh and innovative. By far, my favorite food truck offering!! I just looked them up. Sounds delicious! We’ll have to squeeze it into the schedule. Austin is soooo much fun! 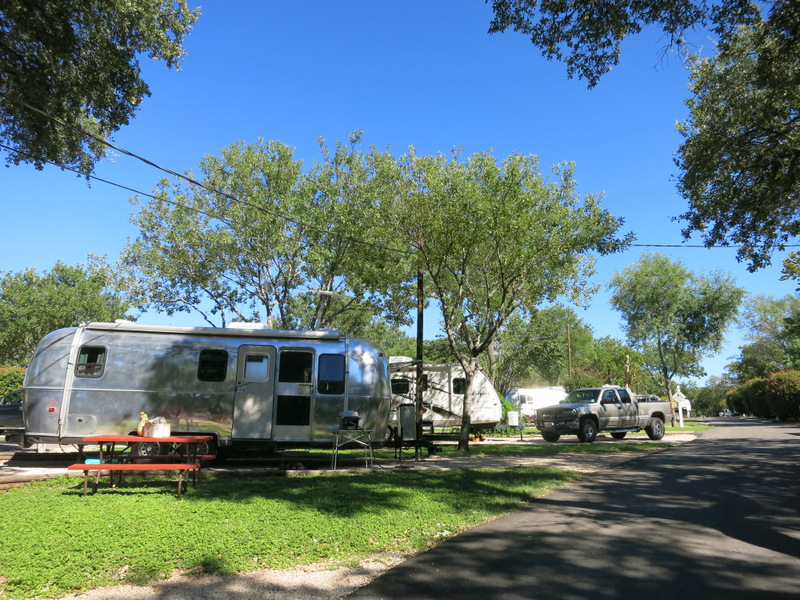 Did you consider staying at Pecan Grove RV park? We loved it there — it’s right in the middle of town and easy to walk everywhere, including the beautiful Zilker Park trails. I’m looking forward to reading about more of your food adventures! 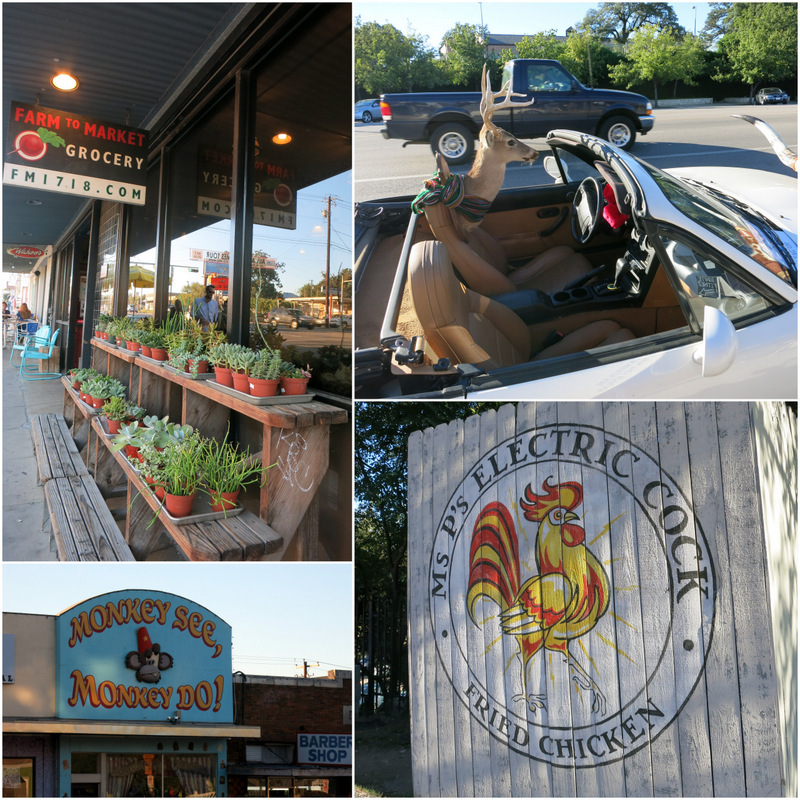 Pecan Grove was actually the first place we tried. Despite the fact that I called many, many months ago we couldn’t get in. I would have never guessed that San Angelo had such beauty. We only saw the main strip full of chain stores. Welcome to Texas! I live in southeast Texas and recently posted a picture of the Beauty Berry Bush on my blog, too. It’s a pretty bush. I hope you enjoy your visit! What a cool plant! Those bright purple berries really stood out on the trail. I live in San Angelo, about half mile from SAMs, so I would have enjoyed treating you to an over night stay at our very quiet state park about 2 miles from SAMs. Maybe another time. My treat. Enjoy Texas ! Sorry we didn’t connect Rick. We considered staying at the State Park, I read there was some really nice bike trails that we wanted to try out. But we arrived late and left early so it just seemed easier to spend a quick night in the parking lot. If we ever come back through I’ll be sure to contact you ahead of time. 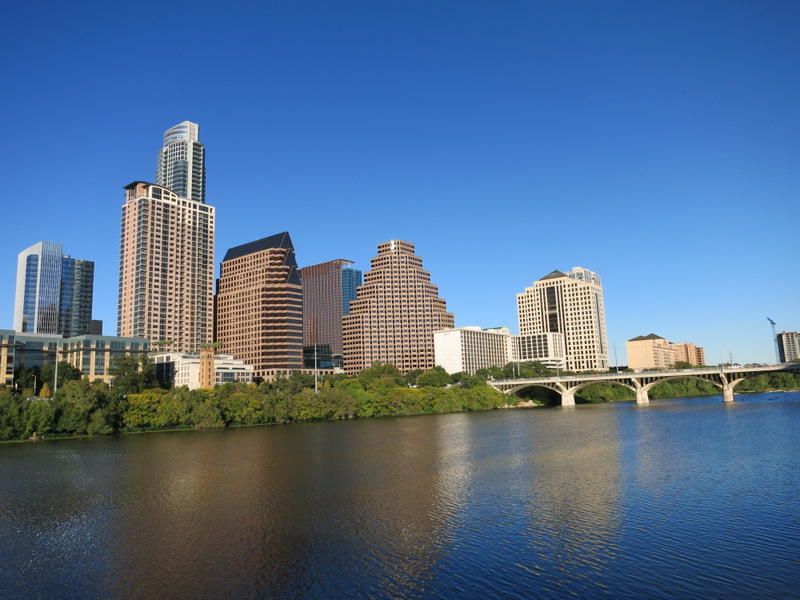 We love Austin and hope to get back again in the next few years to explore in more depth. 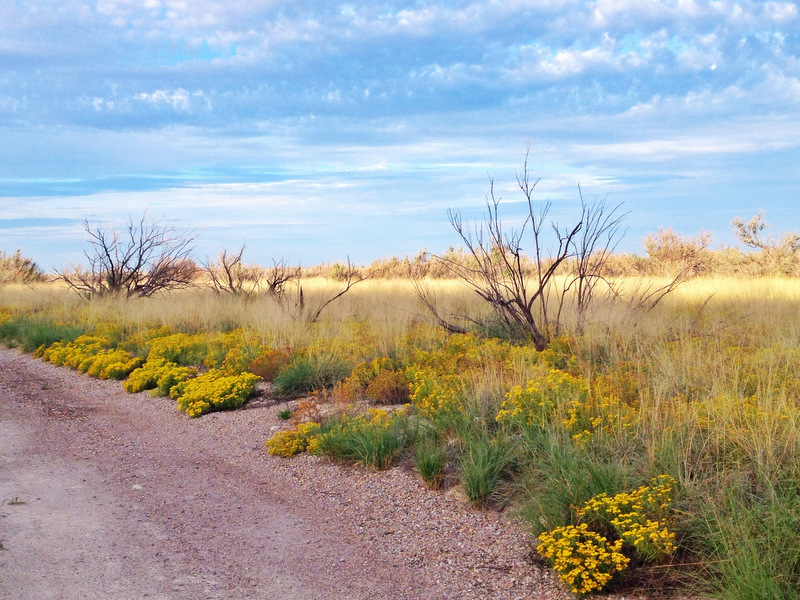 I love that photo of the path Amanda. Looking forward to hearing more about your foodie experiences. Yeah, I feel for you. The scenery around Austin isn’t so great. Everyone goes to Enchanted Rock to get a little verticality. 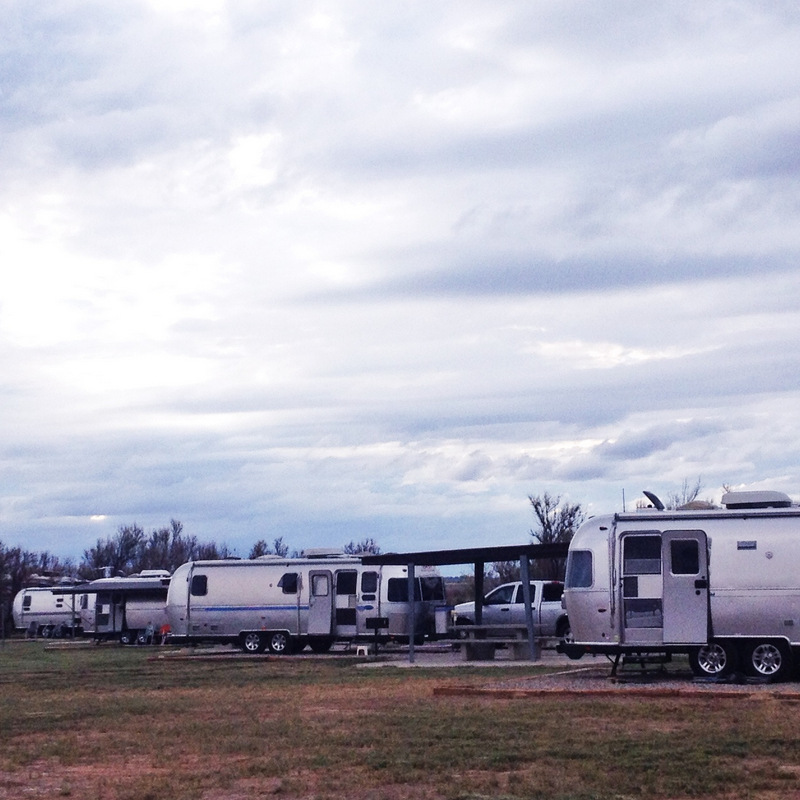 I would like to invite you to come by NTAC North Texas Airstream Community in Hillsboro,Tx. Thanks for the invite Greg! Unfortunately, we’re not going to be around much longer. Headed to Houston on Saturday to catch a flight, and then when we get back continuing east to Louisiana. 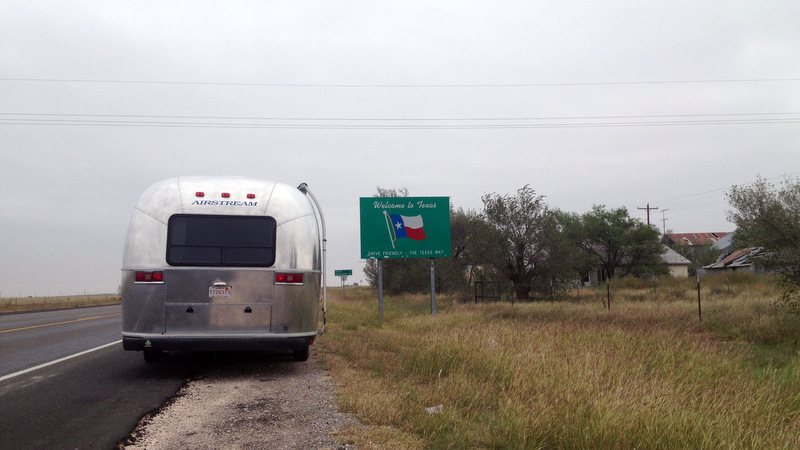 This was just a quick stop in Texas, but we hope to come back late next fall or winter.